Super Tuesday delegate math: Why does Georgia get more than Ohio? 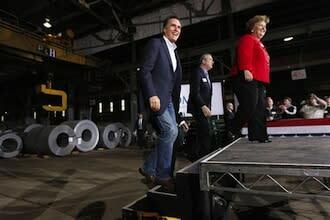 Mitt Romney made a beeline for Ohio after winning the Michigan and Arizona primaries to kick off his campaign for the most populous state that votes on Super Tuesday, when 10 states will participate in the Republican Party's presidential nominating process. With 18 electoral votes, Ohio is a big battleground in the general election, when the number of Electoral College votes are proportional to a state's population. But on Super Tuesday, Georgia--which has only 16 electoral votes in November--is an even bigger prize. Georgia will send 76 delegates to the Republican nominating convention in November, while Ohio will send 66. Why does Georgia, a smaller state, get more delegates than Ohio? In the Republican Party, delegates are awarded based only partly on a state's population. The Republican Party gives extra delegates to states where a majority voted for the Republican presidential candidate, John McCain, in 2008. A bonus delegate goes to each Republican senator a state has elected since 2008, and another bonus delegate is awarded if 50 percent or more of the state's U.S. representatives are Republican. Electing a Republican governor and a majority-Republican state senate or house since 2008 also gets states extra delegates. That's why Ohio, with a population of 11.5 million, has 10 fewer delegates than Georgia, with a population of 9.8 million. Ohio has a Republican governor, state legislature, and Congressional delegation, but it went for Barack Obama in 2008. Georgia picked up 14 extra delegates for voting for John McCain in 2008, according to an analysis by delegate scholar without portfolio Richard E. Berg-Andersson at the Green Papers. These presidential delegates are counted by adding 4.5 to 6/10ths of the state's total electoral vote in 2012. Other states' delegates-to-population ratio are even more lopsided. Alaska has 27 delegates even though the state's population breaks just 700,000. South Carolina, with a population six times that, gets only 25 delegates. That's because of another wrinkle affecting delegate counts: The Republican Party recently changed its rules so that most states were not allowed to hold their primaries before March 6. New Hampshire, Florida, South Carolina, Michigan and Arizona each lost half their delegates because they ignored this rule. All told, Tuesday's contests in Ohio, Massachusetts, Virginia, Georgia, Tennessee, Oklahoma, Vermont, North Dakota, Alaska and Idaho will award 437 delegates--almost 40 percent of the 1,144 needed for a candidate to win the nomination.